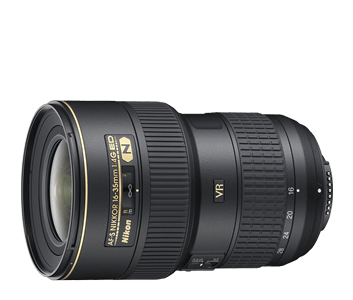 A super-wide angle lens that comes with handy zoom and exceptional image quality, the AF-S NIKKOR 16-35mm f/4G ED VR is the ideal camera for a range of indoor or outdoor photography as well as HD videos. The 16-35mm focal range offers the versatility to shoot fine art photography, landscapes, skylines and more. Its fixed f/4 aperture, remarkable Vibration Reduction image stabilization and high resolution offer superb performance for a range of conditions. Explore a world of possibilities made possible by the lens wide-angle range and effortlessly capture wide shots through a viewing angle between 107º to 63º. Its f/4 maximum aperture can be maintained throughout the zoom range for consistent exposure in every shot. Superior image quality across the zoom range is achieved through the use of Extra-low Dispersion glass and Nano Crystal Coat. These lens technologies minimize ghosting, flare and lens aberrations to produce impeccable sharpness, contrast and colour. For more creative options, this lens is fully compatible with a range of 77mm screw-on filters. When shooting without a tripod or in low-lighting, our state-of-the-art Vibration Reduction image stabilization minimizes image blur caused by camera shake. This innovative feature also enables sharper pictures while shooting at shutter speeds up to 2.5 stops* slower than would otherwise be possible. Our Silent Wave Motor (SWM) autofocus system further enhances performance by ensuring quick and precise focus on your subject.